Will a small grid stop WSB being competitive? Could Davies win in 2013? 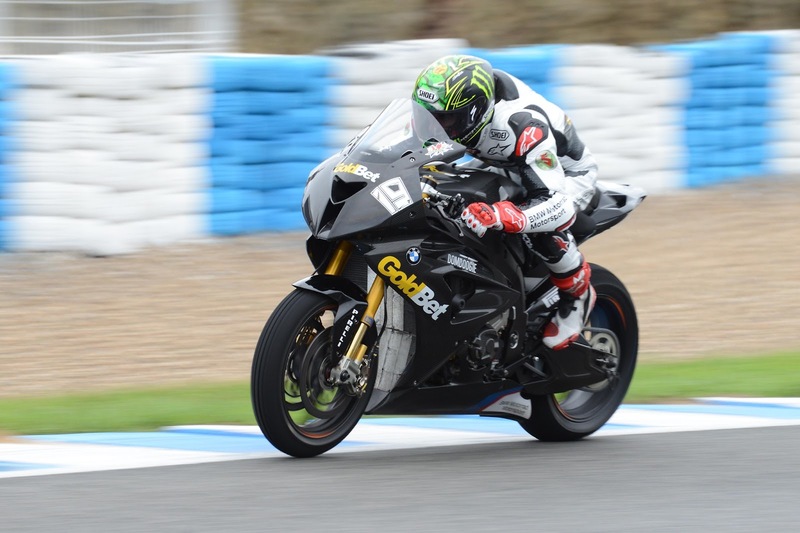 The first official test of the 2013 World Superbike season went ahead over the past couple of days at Jerez, you can view the times and a report here. Although, of course testing is only testing and times shouldn’t be read into too much – after all – the official times report Marco Melandri to be fastest however Kawasaki claim Sykes went faster without a transponder… in all honesty, who knows? Add in who was trying for fast lap times or who was trying to test parts for specific things is another factor, so no this blog will not focus on testing times. We’ve already established that the World Superbike grid for 2013 is shockingly low (you can view the line up here) and whilst this raises huge issues for World Superbikes I somehow don’t think it will lower the sheer competitiveness we saw in World Superbikes in 2012. In 2012, we saw 10 different winners – Melandri, Biaggi, Checa, Rea, Sykes, Guintoli, Baz, Laverty, Davies and Guintoli and I don’t think there’s much reason to believe we will see fewer winners in 2013. This blog will go through all the hopefuls and assess their chances. Firstly, we have to start with 2012 runner up Tom Sykes. Sykes came within grasping distance of the 2013 crown and there is every reason to believe he will be up there in 2013. Tom Sykes was near the sharp end of the 2012 championship for two reasons, firstly consistency – whilst Tom often struggled to stay at the front with the Kawasakis tyre wear problems he remained consistent, he only failed to finish twice. Secondly, Tom Sykes is blisteringly fast – taking pole position in 9 out of 14 chances and shattering numerous lap records along the way. This meant that Tom could be up front during the start of a race and even if he did have tyre wear issues, he could still comfortably come home near the podium. Tom stood on the podium 12 times last year, champion Biaggi stood on the podium 11 times, Tom taking 4 wins, Max taking 5. I think Tom’s chances for 2013 depend on the competition, if the competition is widely mixed like 2012, he will be in with a chance like many others… the problem is, there are many others but what must not be forgotten is that Tom Sykes on that Kawasaki is possibly the fastest man on the grid. Sykes’ team mate Loris Baz joined the Kawasaki team after Lascorz’ awful testing incident and showed potential taking 3 podiums including a race win in his debut season. An observation about Baz’s podiums (and his win) is that he won by having massive balls, old school riding of barging other riders out of the way taking risks that many other riders weren’t willing to take in tricky conditions. Obviously, this style can be detrimental to any chances of consistency as it can pay off, such as it did in Silverstone race 1, or it can bite you in the arse, as it did in Silverstone race 2 where Baz, riding almost 2 seconds faster than eventual race winner Guintoli binned it in quite a fashion. I really like Loris Baz and have liked him since his superstock days – I think he’s a gutsy young rider that will be going places in the future. Championship contender for 2013? Perhaps not, although he’ll certainly be there to play on several occasions. Marco Melandri could well have been World Champion in 2013. Why wasn’t he? Because when the world championship came into his sights he had 3 DNFs in a row leading to a non-start due to injury too. We’ve seen Melandri struggle to take things easy many times before, look when he caused the Donington incident at Goddards causing Haslam to be knocked off taking Melandri himself with him, losing the chance for BMW’s first ever 1-2. Melandri needs to calm down to be within any chance of winning a title. Last year we were questioning the bikes ability, the BMW’s teething issues have now clearly been solved and the S1000RR is perhaps one of the best bikes on the grid however this year I have to question whether Melandri is stable enough to mount a consistent attack on the championship. He can do it, the man’s come second in a MotoGP world championship however with the sheer competition on the grid, it’s not going to be easy for anybody. New to BMW, Chaz Davies could be a secret little threat for the title in 2013. He won the 2011 Supersport title with pure class and I doubt many were too shocked when he clinched his maiden victory in his first year in the series. Davies is a pure talent and is a credit to Britain, definitely one of our secret weapons in World Superbikes. Of course, you cannot discount the team which took Max Biaggi to the title in 2013 – the factory Aprilia team. I was very disappointed with Laverty in 2012, perhaps I shouldn’t have been too shocked as you have to question the fate of anyone who is the team mate of Max Biaggi however this year there shall be no excuses for the Irishman. 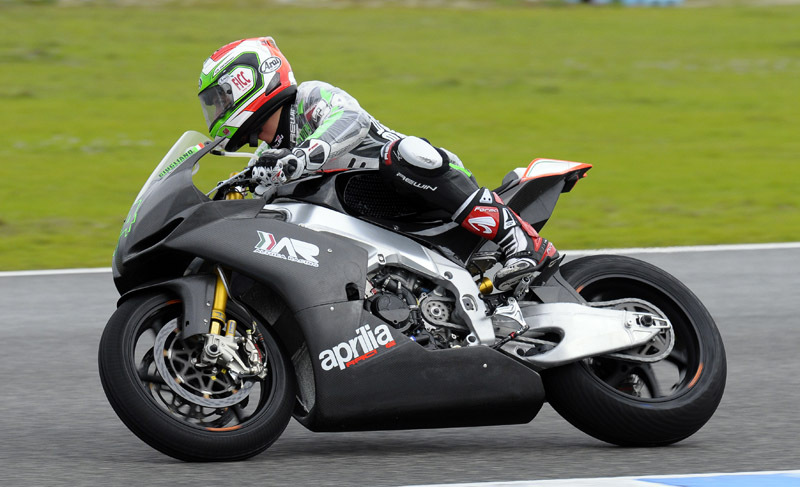 Laverty has talent and the Aprilia is perhaps the best machine on the grid.. I expect him to be a regular front runner in 2013 and I’ll be serious disappointed if we see a repeat of 2012 where it took until the penultimate round for him to win a race. One thing going against Laverty however, is although he’s rid of the poisoned dwarf that was Max Biaggi his new team mate could be a force to be reckoned with. It’s quite frankly about time Sylvain Guintoli found himself on a factory prepared bike. It’s easy to forget when he rocked up to the British Superbike championship, won the first race and remained on the pace thereafter on tracks he’d never ridden before, looking like a serious contender for the title until the incident with Josh Brookes, leaving Leon Camier to run away. Something else that shouldn’t be forgotten is that Guintoli won 3 races last year (only the top 4 riders in the championship won more) despite being sacked by one team and moving over to another mid season missing one round entirely. Guintoli was tipped for a return to BSB for 2013 however it’d have been a bad move, he’s a class act and I’d personally be quite scared if I were Eugene Laverty, as he might be the new aprilia big boy, but Sylvain is some serious competition. It’s Jonathan Rea’s 5th year with ten Kate Honda. For 5 years now, we’ve been wondering the potential of Jonathan Rea on the CBR1000R Honda and for six years we’ve been saying exactly the same thing – a bit of consistency and we’ll see Johnny up there. However, in 2012 you could clearly see that Jonathan Rea was not on the best bike on the grid yet it was quite clear that Jonathan Rea was riding the absolute hell out of it. Jonathan Rea is a superb rider, look at his stint in MotoGP last year which was certainly impressive. He rides the bike so hard, he either wins or bins and unfortunately that’s not how to win a championship, however 2013 could well be different. Not only do ten Kate Honda have funding in the form of PATA (and a stunning machine it is) they also have increased support from the big dogs at HRC. If there’s any year that Jonathan Rea will take the Honda to the top, it’s 2013. Honda’s second signing for 2013 shows their clear intent at wanting a shot at the championship, whilst Leon Haslam didn’t have a single victory in his 2 years at BMW it still can’t be forgotten than he came 2nd to Max Biaggi in 2010 on a very unsupported Suzuki and in 2009 he took a private Honda very close to the front. Haslam has pace however the thing I’ll question with Haslam, is confidence. Haslam worked hard at BMW in 2011 and had an awful season, when it looked like the bike would get better for 2012 he stayed on board yet BMW shipped in Melandri who quite simply ruled the roost – again, look at the Donington 2010 incident, wouldn’t any other rider be happy their team mate had won the race and their team taken a 1-2 rather than making a stupid move leaving both of them in the dirt? Yes, Haslam’s confidence must have taken a knock in the last 2 years and it will need rebuilding if we’re to see him at the front yet the only way to build the confidence and be a title contender, is to be near the front before it’s too late. Alstare is back in 2013 and have taken over the factory supported Ducati status, retaining Carlos Checa and signing Italian Ayrton Badovini. Checa won the 2011 world championship in pure style, he was the best rider on the grid from the start and it didn’t take long to see he was not going to be beaten. 2012 was difficult for the Spaniard, on a machine that clearly lacked straight line speed and was getting old. He’s got a new 1199 Panigale to ride this year and I’m hearing a lot of scepticism and I’m not quite sure why. Checa may be old but he showed last year he could still win races in style. I think a lot of bad stigma the Panigale has got is from BSB where it performed terribly, probably due to the different regulations. Yet in European STK1000 it took the bike only 3 races to win and Eddi La Marra took it to second in the championship. The Panigale could be on fire next year and Checa is certainly the man to ride it. Badovini impressed in his first year on the BMW Italia machine however it was hardly surprising they dropped him after a poor 2012 campaign, especially as the team gained factory status. He can be quick and I’d say watch out for him, however I can’t see him being a regular front runner. Crescent Suzuki are upping their effort in 2013, they have more powerful engines – the one drawback Leon Camier claimed to have in 2012. Camier was promoted up to number one rider after an injury full season for John Hopkins and showed brilliance towards the end of the season, taking the GSXR-1000 closer and closer to the front, I have faith that Camier will continue where he left off and the British team, now solely under Paul Denning after the departure of Big Jack Valentine will continue to develop. I can’t see Camier winning championships quite yet but I wouldn’t count him out of the odd race win. His team mate, former Moto2 rider Jules Cluzel made quite the storm in Supersport last year – showing he clearly has the pace to ride a production motorcycle. He claims to be comfortable on the Suzuki, I’d say Cluzel is very much an unknown quantity but I certainly wouldn’t count out seeing him near the front occasionally. Impressive in 2012, was Giugliano. Can he improve? Someone I would not write off for a race victory or two in 2013 is Davide Giugliano on the factory-backed Althea Aprilia. Giugliano seriously impressed me last year, as we’ve already established when talking about Carlos Checa and Sylvain Guintoli the 1198 was not the best bike on the grid, yet Giugliano took it to the podium twice in his debut season. He did often fall off, as young riders in their debut season do but I’d say he learnt a lot. Recorded times from the recent test (remember, we don’t look too much into timing) place him second. We’ve seen Althea aren’t a shabby outfit even when they are a satellite squad and Bevilacqua has referred to Davide as his “secret weapon”. Perhaps not a championship contender, but I see he could very much imitate Davies’ 2012 run on a satellite Aprilia. Speaking of satellite Aprilias, I’ll get this over with quickly. I lost patience with Michel Fabrizio during his 2011 campaign with Suzuki, throwing the bike down the road every other weekend. It’s a shame, as back in the Xerox Ducati days he was very talented and I once tipped him as a title contender, I predicted he wouldn’t have a fab year with BMW Italia and I highly doubt he’ll have a fab year with the Aprilia. Perhaps it’s time to move over, Michel? I’m quite delighted to see Max Neukirchner back for 2013 on board a Ducati Panigale, I can’t say I think he’ll set the world on fire however I was a huge fan of Max back in his Alstare Suzuki days, where until Checa wiped him out at the last corner of Valencia he was a frequent front runner. Obviously, as usual the Pedercini Kawasakis will be near the back of the grid, although Lundh did have a couple of good showings for them last season and Grillini BMW with Iannuzzo and the new HTM BMW team seemingly running Ivan Clementi will be joining them at the back. In 2012, there were 10 winners and I think there are 12 riders on the grid, perhaps 13 with potential of taking at least one win in 2013: Sykes, Baz, Checa, Haslam, Rea, Melandri, Davies, Laverty, Guintoli, Giugliano and maybe Camier and Badovini. The championship contenders I predict to be Sykes, Checa, Rea, Melandri, Davies, Laverty, Guintoli and perhaps Haslam. Even though the grid is shockingly small and there are issues with round confirmation, 2013 world superbikes could be bloody excellent. Interesting esp re Haslam, Melandri and BMW. I still think given the loyalty and work Leon showed, BMW should've been clearer about Melandri's behaviour being unacceptable. It ruined a 1-2 following a win. All BMW said was Johnny Rea was in the wrong! Leon was entitled to better. If that wasn't the time he chose to leave I'd be surprised.